(as described in Lewis's Topographical Dictionary of Ireland, 1837) "Crosshaven, a village, in the parish of Templebready, barony of Kerrycurrihy, county of Cork, and province of Munster, 5 miles (E. S. E.) from Carrigaline; containing 513 inhabitants. It is situated on the noble estuary to which it gives name, but which is more generally known as the river Carrigaline, within the harbour of Cork, opposite to Dog's nose Point, and a little west from Ram Head; it comprises about 100 houses, which are small, but well built; and is one of the eight coast-guard stations in the district of Cobh. In the creek a vessel may ride in 10 or 12 feet of water. 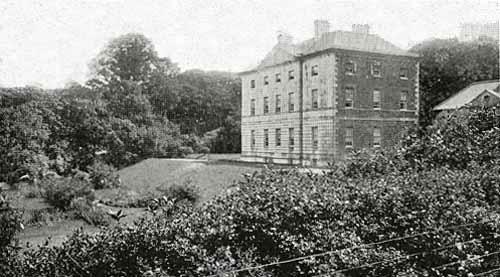 Crosshaven House, the residence of T. Hayes, Esq. ; Camden Fort (described in the account of Templebready), and several handsome villas and lodges, the summer residences of those who visit the coast for sea-bathing, closely adjoin the village. An extensive fishery was formerly carried on, but it has so much declined that only five small vessels remain, and these are occasionally employed in the grain and coal trade"
Fort Camden (officially known as Fort Meagher), area 41 acres, elevation 67m O.D .is a Classical Coast Artillery Fort. Fortifications date from about 1550. They were further added-to in 1600. However, after the Battle of Kinsale the Fort became derelict. At the end of the 17th century the Fort was fortified by the Jacobites in an effort to block the Williamites' naval forces. In 1690 it fired on the Williamite fleet as it entered Cork Harbour, but was silenced by a party sent ashore to attack it. It was known as James' Battery and consisted of two blockhouses and eight guns. During the war against the French in the late 1780's Crosshaven got a permanent garrison and the threat of war with Spain around 1790 led to the erection of new gun batteries on the site. By 1837, the Fort contained only a token force of a master gunner and eight men. The land side of the Fort was modified for the mounting of 30 additional guns. The fort area is honeycombed with underground passages and emplacements including a large magazine. It has a magnificent tunnel, engineered to house the fixed torpedo invented by Louis Philip Brennan. The Fort was handed over to the Irish Army in 1938, and in 1989 Cork County Council acquired ownership.